WINNIPEG - Canada's new indigenous affairs minister says an isolated reserve under one of the country's longest boil-water advisories will get a much-needed lifeline to the rest of the country. 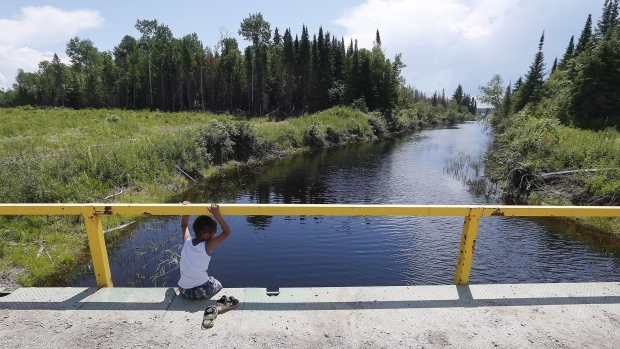 Carolyn Bennett says the federal government is committed to seeing an all-weather road built to connect the Shoal Lake 40 First Nation to the mainland. The reserve on the Manitoba-Ontario boundary was cut off a century ago during construction of an aqueduct which carries fresh water to Winnipeg. Surveyors said at the time that the land was largely uninhabited "with the exception of a few Indians." While clean water continues to flow to the Manitoba capital, the reserve of several hundred people has been under a boil-water advisory for 18 years. The Liberal government is committed to ending that injustice, Bennett said in an interview with The Canadian Press. "This is a serious commitment and it will happen," she said. "So many of these issues are no longer indigenous issues. These are Canadian issues about our values and principles and how we can go forward in a good way." A formal announcement is coming "in the near future," she said. In the summer, the First Nation depends on an aging ferry to get to the mainland, but the vessel failed government inspection this year. Residents use a treacherous ice road in the winter and people have died falling through the ice. Health-care workers and ambulances won't risk going to the community and children have to leave the reserve to continue their education past Grade 8. A water treatment plant is prohibitively expensive without a road to transport construction equipment. Residents have long talked about the need for a "Freedom Road," which would be both a symbolic and concrete beginning to right the wrong done a century ago. The former Conservative government refused to commit to help fund construction of a road, despite commitments from the province of Manitoba and the City of Winnipeg to split the cost three ways. Bennett suggested the road is an important part of reconciliation. "These are examples of the kinds of steps you have to take to right the wrongs." A design study - paid for by the federal, provincial and municipal governments - is expected to be completed in January. The reserve is hoping to begin construction shortly thereafter. The road is expected to cost around $30 million. The Manitoba government has already introduced a bill in the legislature that would give it legal authority to help fund construction of a permanent road. Premier Greg Selinger called the road a "key infrastructure project." "We've been talking about it for a long time," he told a luncheon Tuesday held by the Winnipeg Chamber of Commerce, which has been pushing for the road's construction. "That will get built now."